The Chase Ink Business CashSM Card is a popular small business credit card that earns up to 5% cash back on select category purchases, has a healthy sign-up bonus, and doesn’t charge an annual fee. It’s basically the cash back, no-annual-fee version of Chase Ink Business Preferred, which has a points-based rewards system and comes with a $95 annual fee. Chase Ink Business Cash is great for small business owners who prefer to earn cash back on everyday purchases, such as office supplies, gas, and restaurant meals, rather than deal with a points-based rewards system. In fact, it has one of the best cash back rewards programs of any no-annual-fee business credit card on the market today. A 12-month 0% APR for purchases makes it a good card for financing big-ticket purchases right out of the gate. If you’re a freelancer or sole proprietor who doesn’t really think of yourself as a business owner, you can still qualify for Chase Ink Business Cash. Chase simply requires that the primary cardholder be the owner or representative of an incorporated business, including a sole proprietorship, and affirm that the card is to be used exclusively for business expenses. If you spend at least $3,000 within 3 months of opening your account, you get a $500 cash bonus that can be redeemed for a statement credit, bank account deposit, Ultimate Rewards merchandise purchase, travel purchase, or special experience, such as a dinner cruise. Ink Business Cash earns 5% cash back on office supply and telecommunications purchases (including cell phone, landline, Internet, and cable TV), up to $25,000 per year; 2% cash back on gas station and restaurant purchases, up to $25,000 per year; and an unlimited 1% cash back on all other purchases. After you hit the $25,000 annual limits, additional purchases in the 5% and 2% categories earn an unlimited 1% cash back. Each “year” begins and ends on the anniversary date of your account opening. You can redeem your accumulated cash back for statement credits, bank account deposits, gift cards, general merchandise purchases through Chase’s Ultimate Rewards shopping portal, travel purchases, and special experiences, such as cooking lessons and dinner cruises. 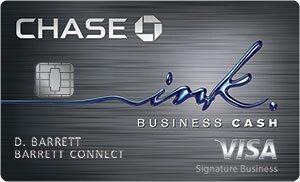 You can apply for additional Ink Business Cash cards for authorized employees at no additional charge. Employee cards earn rewards at the same rate as primary cards. Chase’s free Ink app lets you track purchases in real-time, category-tag purchases for record-keeping purposes, change authorized cardholder (employee) spending limits, analyze spending over time, and perform other useful functions from your mobile phone or tablet. You can sign up for free, real-time alerts that provide location, transaction, and balance information for every employee purchase. Chase Checkout is a mobile point-of-sale system, similar to Square for Business, that allows you to accept credit card payments wherever there’s a wireless Internet or 4G broadband connection. Chase Checkout’s mobile version comes with mobile card swipers (dongles) that attach to your phone or tablet. You do need to fill out a separate application for Chase Checkout, and additional payment processing fees apply (2.75% to 3.75% of the total transaction amount, with a $25 monthly minimum). This card has a 12-month, 0% APR promotion on purchases. Once the introductory period ends, Ink Business Cash’s regular APR ranges from 15.49% to 21.49% variable, depending on prevailing interest rates and your personal creditworthiness. 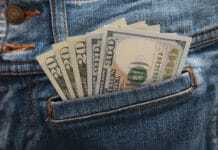 The cash advance APR is 27.24% variable from the day you open your account. There is no penalty APR. Ink Business Cash doesn’t have an annual fee. 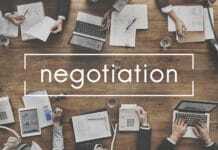 However, foreign transactions cost 3% of the total transaction amount, cash advances cost the greater of $15 or 5%, and balance transfers cost the greater of $5 or 5%. Chase’s Purchase Protection plan provides up to $10,000 per item in damage and theft coverage, good toward replacements and repairs. The benefit lasts for 120 days from purchase and is capped at $50,000 total per account. Chase’s Extended Warranty Protection plan provides a complimentary 12-month warranty extension on all warranties with original terms of three or fewer years. Chase Ink Business Cash requires good to excellent credit. Big Sign-up Bonus. This card’s sign-up bonus is worth $500. That’s well above average for the no-annual-fee small business credit card category. No Annual Fee. Ink Business Cash doesn’t charge an annual fee. That sets it apart from many competing cash back business credit cards, including Capital One Spark Cash for Business. Flexible Reward Redemption. Like Chase Freedom and other popular Chase rewards credit cards, Ink Business Cash lets you redeem your accumulated cash back for virtually anything: statement credits, bank account deposits, travel, general merchandise, gift cards, and even exotic experiences. Other no-annual-fee business cards, such as Capital One Spark Classic for Business (statement credits and bank account deposits only) and U.S. Bank Business Edge WorldElite (statement credits, bank account deposits, and gift cards only), are much more restrictive. 0% APR on Purchases for 12 Months. Ink Business Cash’s 12-month 0% APR promotion is actually pretty unusual in the no-annual-fee business credit card world. No Fees for Employee Cards. You don’t have to pay for additional authorized users on your Ink Business CashSM account, no matter how many you add. That’s a big perk if you’re looking to hook multiple employees up with Ink Business Cash cards. The Business Platinum Card from American Express charges $175 total for the first three additional authorized users, and then $175 for each additional authorized user after that. Chase Checkout Simplifies Payment Processing. Chase Checkout is a great payment processing aid for small, mobile businesses that don’t want to invest in bulky cash registers or payment terminals. Many other business card issuers, including Capital One, don’t offer their own payment processing systems. High Sign-up Bonus Threshold. You need to spend $3,000 within 3 months to earn Ink Business Cash’s $500 sign-up bonus. While that’s more than doable for established, thriving businesses, it’s likely to be tougher for penny-pinching startups. High Foreign Transaction Fees. Ink Business Cash’s 3% foreign transaction fee is higher than that of many competitors. Capital One Spark Cash and Spark Miles for Business don’t charge any foreign transaction fees. High Balance Transfer Fee. Ink Business Cash’s balance transfer fee is the greater of $5 or 5% of the transferred amount. On a $500 transfer, that amounts to $25. By contrast, the Capital One Spark Miles Select and Cash Select cards don’t charge for balance transfers at all. And many other business credit cards charge just 3% for transfers, cutting the cost of a $500 transfer by $10. Relatively Low Spending Caps for the 5% and 2% Categories. Ink Business Cash caps spending in the 5% and 2% categories at $25,000 per year. That’s a low limit in the business credit card world, where caps of $50,000 or $100,000 – or none at all – are commonplace. For instance, U.S. Bank Business Edge WorldElite MasterCard’s 3% category allows unlimited spending. The Chase Ink Business CashSM Card is a great business financing option for small business owners, but it’s not suitable for everyone. Compared with some other business credit cards, Ink Business Cash’s spending caps are relatively low, meaning it’s hard for heavy-spending business owners to maximize the card’s value. If you find yourself regularly exceeding the $25,000 annual spending limits in the 5% and 2% categories, consider upgrading to Chase Ink Business Preferred (which does come with a $95 annual fee) or another business rewards credit or charge card better suited to larger companies. Conversely, Ink Business Cash is a good choice for business owners in the midst of downsizing or cutting back on their credit card use. However, since Ink Business Cash’s spend-$3,000-in-3-months sign-up bonus is hard for cash-strapped businesses to attain and the fee-free employee card benefit is useless for business owners without multiple employees, it’s not the ideal card for very small companies or scrappy sole proprietors. The Chase Ink Business CashSM Card is a great cash back card choice for business owners that crave flexible reward redemptions, 0% APR on purchases for 12 months, rewards for everyday purchases (such as food and fuel), and fee-free employee credit cards. Plus, Chase Checkout is useful for on-the-go business owners who sell in the field, such as food truck operators and art vendors.